Bulk SMS is a powerful tool for promoting premium services offered on kwak’s Premium Rate Numbers. Bulk SMS saves you time reaching your audience and precise targeting makes efficient use of your marketing budget. If you are already a user of our Premium Rate Number services you can easily register for our SMS services here (link to registration page) by providing your existing account username and password. Our global SMS coverage will help you promote your services to any country around the world. Start sending SMSs within minutes and establish a strong communication channel with your customers. As a PRN customer who has ongoing business with kwak you will be eligible to special payment terms (assessment of current PRN business will be necessary). kwak Outbound SMS is the right solution for your business no matter if you target a local, a regional or a global audience. Register for an SMS account and promote your services to your target audience! Decrease your costs and increase the efficiency of your promotions and increase your conversions by addressing your audience directly on their cell-phones. Our price list with current coverage and prices is available on request. Get our latest SMS prices and tell us your direct marketing needs. We are convinced we can help! We offer special prices for high volumes. We can provide you with access to almost any country or mobile network around the world. 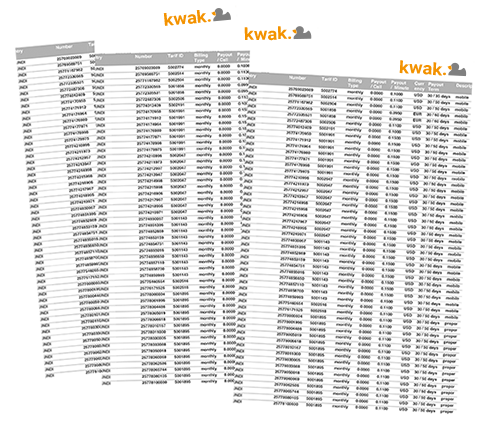 kwak’s advantage is the huge number of direct interconnections with telecommunication carriers and operators all over the world. Thanks to our long-standing experience in the field of value added services we know precisely what the needs of today’s outbound campaigns with global reach are.